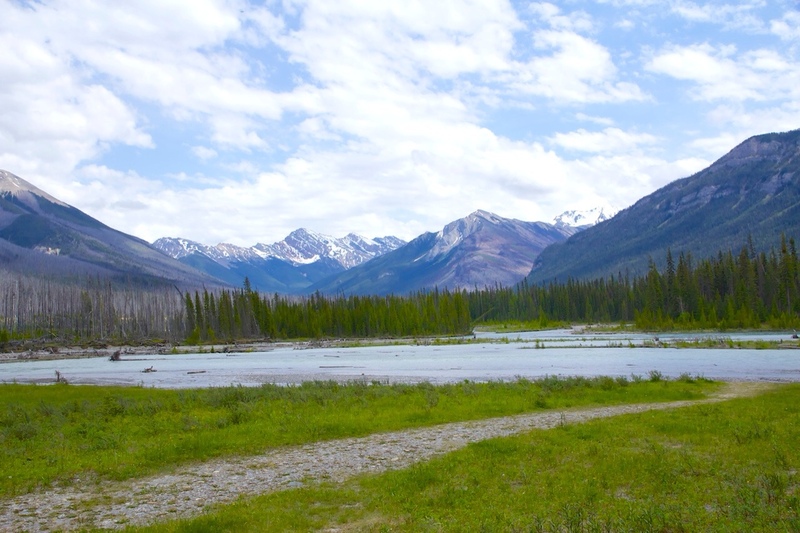 We left the Crowsnest area of British Columbia and headed north along the west side of the Rockies, through Kootanay National Park and into Banff National Park. It was just more beautiful mountain scenery, although as we set up camp low clouds stared rolling in. Setting up camp entailed plugging into an electrical outlet along the side of a road. Our rig is too big to fit in the more rustic campgrounds so we are in what is basically rows of asphalt lined with campers and RVs. 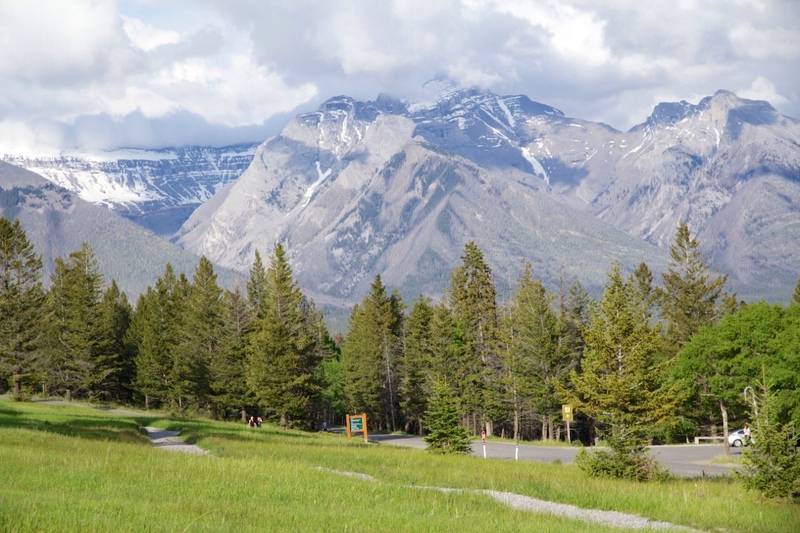 However, all we have to do is look up and we are surrounded by the majestic Rockies. 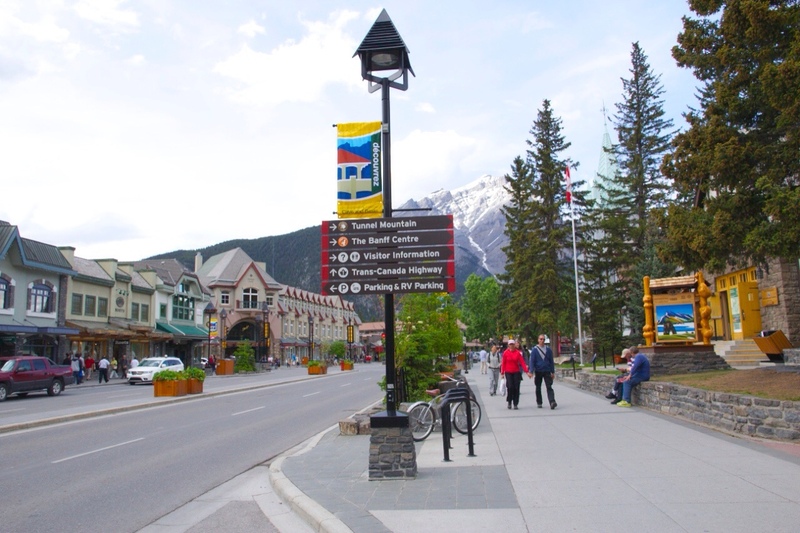 I walked around snapping some shots of the great views and we drove into Banff Village to pick up some supplies and enjoy the sights there. It was a good thing we did this right away, because this would be the last time we would see these glorious peaks. It has been raining for three days. No fishing, no enjoying the miles of trails that beckon, no visiting the canyons and waterfalls that were on on list of things to do. When it has let up we have driven around to see some of the sights, but mostly we have hunkered down, done some laundry and caught up on our reading. The mountains are shrouded in clouds and mist. 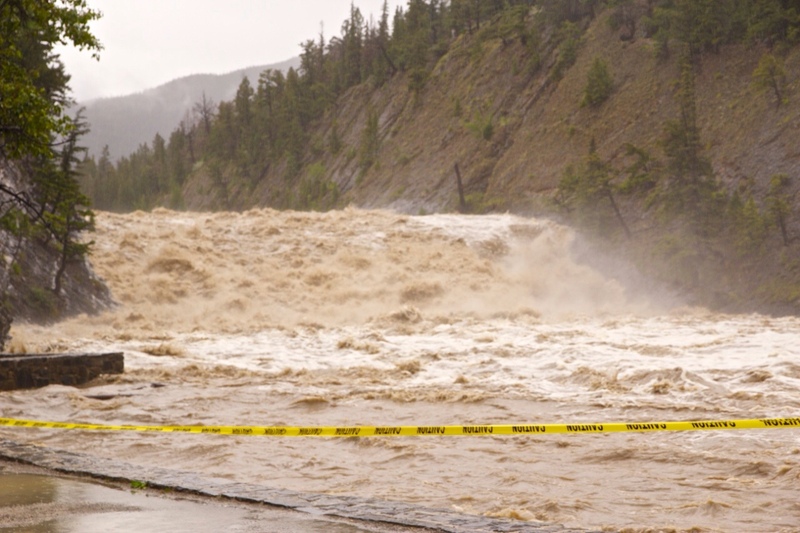 The Bow River has reached record levels, Calgary, to our southeast, is evacuating major areas and is in a state of emergency and the road we are to take to Lake Louise tomorrow is closed due to mud slides. We have extended our stay here for a day and wait for word that the road is reopened. However it is still raining, the water is still rising and we will stay put until it is safe to move on. On the bright side I have time to catch up on my postings, now we just have to go find some Internet access. Oh, my, goodness! Your last post was so beautiful and sunny. What a difference a day makes (or three)! Stay safe. I hope you are able to get on to your next stop. The Bighorns are gorgeous! What an experience. That river is something else. Glad you all are safe. Our daughter has just been evacuated from downtown Calgary. Stay safe and dry! WOW, we missed this area on our way down from Alaska. 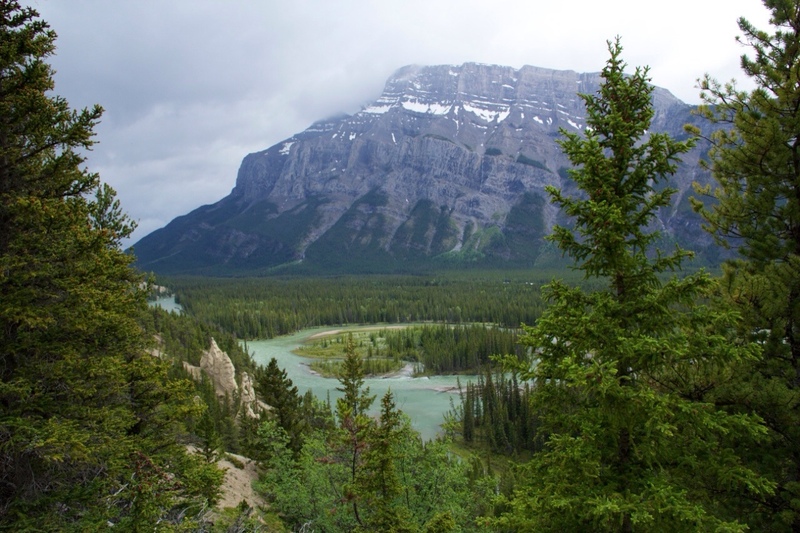 Thank you for your beautiful pictures, we really have to go to Banff. We had a similar situation on our way to Alaska, we got stranded at Dawson Creek for a week due to mudslides and washout bridges. Stay safe and enjoy the views even if rain and clouds obscured it. It is lovely out there. We have been reading about all the rain and floods. Stay dry and safe. we try to. 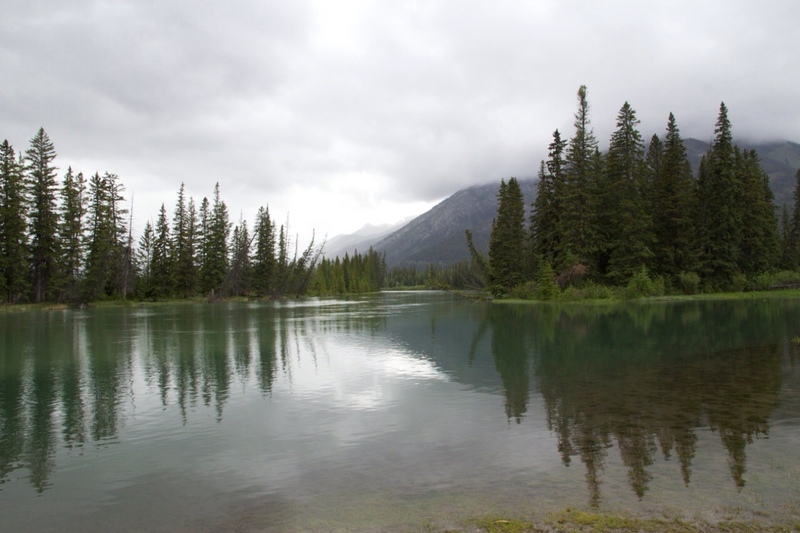 it rains, then it is sunny, then it rains…we were lucky to be in banff for four dayswhen the rains came and the parks were very accomodationg with reservation adjustments if needed. We are hearing about the rain in your area. Daughter works at Cold Lake and lives in Calgary. She had planned to go to Vancouver even with all the rain and floods. We know she has left but not yet heard if she has arrived. Other friends in Calgary tell us of their preparation to evacuate. Sure hope the next few days are safe for you. Better to stay put and off the road while all the rain and floods are under way. Stay put and stay safe. Cheers from Downunder. luckily we were at a camp well away from the river and stayed high and dry during the rains. 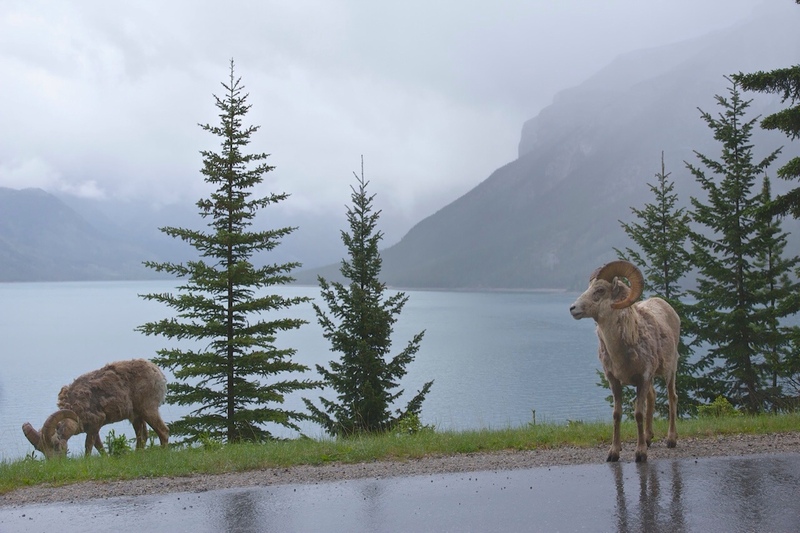 roads were wiped out, mudslides all over the place, but we were able to move up to Lake Louise and next to Jasper with no problems since they got that road re opened. road to canmore and calgary is still closed I believe, they had a terrible flood. we have had rain on and off, alternating with lovely sun. There’s no predicting it so we run out and enjoy the scenery when we can.